Ashes by Laurie Halse Anderson — As the Revolutionary War rages on, Isabel and Curzon are reported as runaways, and the awful Bellingham is determined to track them down. With purpose and faith, Isabel and Curzon march on, fiercely determined to find Isabel’s little sister Ruth, who is enslaved in a Southern state. The final book in Anderson’s ‘Seeds of America’ trilogy. “A rich cast of characters, nonstop adventures, lively dialogue, vivid battlefield descriptions, budding romance, and an informative appendix are hallmarks of this excellent novel and this compelling, must-have historical fiction series” (School Library Journal). Audacity by Melanie Crowder — A gorgeously told novel in verse written with intimacy and power, this book is inspired by the real-life story of Clara Lemlich, a spirited young woman who emigrated from Russia to New York at the turn of the twentieth century and fought tenaciously for equal rights. “This fictional narrative, based on Lemlich’s real-life experiences, illuminates the labor-union movement, especially the women’s strike known as the Uprising of the 20,000” (Booklist). Crossing Ebenezer Creek by Tonya Bolden — Freed from slavery, Mariah and her young brother Zeke join Sherman’s march through Georgia, where Mariah meets a free black named Caleb and dares to imagine the possibility of true love, but hope can come at a cost. “This moving and engrossing portrayal of a little-known historical tragedy belongs on all YA shelves” (School Library Journal). 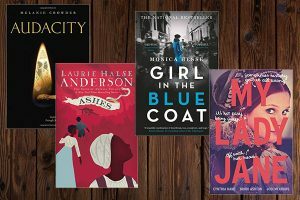 The Girl in the Blue Coat by Monica Hesse — In 1943 Nazi-occupied Amsterdam, teenage Hanneke–a ‘finder’ of black market goods–is tasked with finding a Jewish girl a customer had been hiding, who has seemingly vanished into thin air, and is pulled into a web of resistance activities and secrets as she attempts to solve the mystery and save the missing girl. “Thoroughly researched, this work brings history alive in a clear and concise way that rings true” (School Library Journal). The Librarian of Auschwitz by Antonio Iturbe — Follows Dita Kraus from age fourteen, when she is put in charge of a few forbidden books at Auschwitz concentration camp, through the end of World War II and beyond. Based on a true story. “Like Markus Zusak’s The Book Thief (2006), it’s a sophisticated novel with mature themes, delivering an emotionally searing reading experience” (Booklist). My Lady Jane by Cynthia Hand — On the eve of her marriage to a stranger, sixteen-year-old Lady Jane Grey is swept in a conspiracy to usurp the throne from her cousin. “Wonky, offbeat, and happily anachronistic the references run the gamut from Shakespeare to Monty Python, with plenty of nods to The Princess Bride this fantasy adventure politely tips its hat to history before joyfully punting it out of the way” (Booklist). The Passion of Dolssa by Julie Berry — In mid-thirteenth century Provence, Dolssa de Stigata is a fervently religious girl who feels the call to preach, condemned by the Inquisition as an “unnatural woman,” and hunted by the Dominican Friar Lucien who fears a resurgence of the Albigensian heresy; Botille is a matchmaker trying to protect her sisters from being branded as gypsies or witches–but when she finds the hunted Dolssa dying on a hillside, she feels compelled to protect her, a decision that may cost her everything. “The panic and suspicion of post-Inquisition France is omnipresent, giving the story of a supposed heretic a constant edge of danger” (School Library Journal). Soldier Boy by Keely Hutton — Follows Ricky from 1987-1991, and Samuel in 2006, as they are abducted to serve as child-soldiers in Joseph Kony’s Lord’s Resistance Army in Uganda. Includes historical notes and information about Friends of Orphans, an organization founded by Ricky Richard Anywar, on whose life the story is partly based. “A must-purchase for teen collections, with the understanding that this text portrays traumatic childhood violence associated with civil war” (School Library Journal). The Steep & Thorny Way by Cat Winters — A sixteen-year-old biracial girl in rural Oregon in the 1920s searches for the truth about her father’s death while avoiding trouble from the Ku Klux Klan in this YA historical novel inspired by Shakespeare’s ‘Hamlet’. “Winters amplifies the story by weaving Oregon’s troubling true history state-sanctioned discrimination, eugenics, forced sterilization throughout the tale, adding weighty, unsettling context to the slow-burning mystery” (Booklist). An Uninterrupted View of the Sky by Melanie Crowder — In Bolivia in 1999, when their father is unjustly arrested and their mother leaves, Francisco, seventeen, and his sister Pilar, eight, must move to the dirty, dehumanizing, and corrupt prison. “This hard-hitting, ultimately hopeful story will open readers’ eyes to a lesser-known historical moment and the far-reaching implications of U.S. policy” (Booklist).